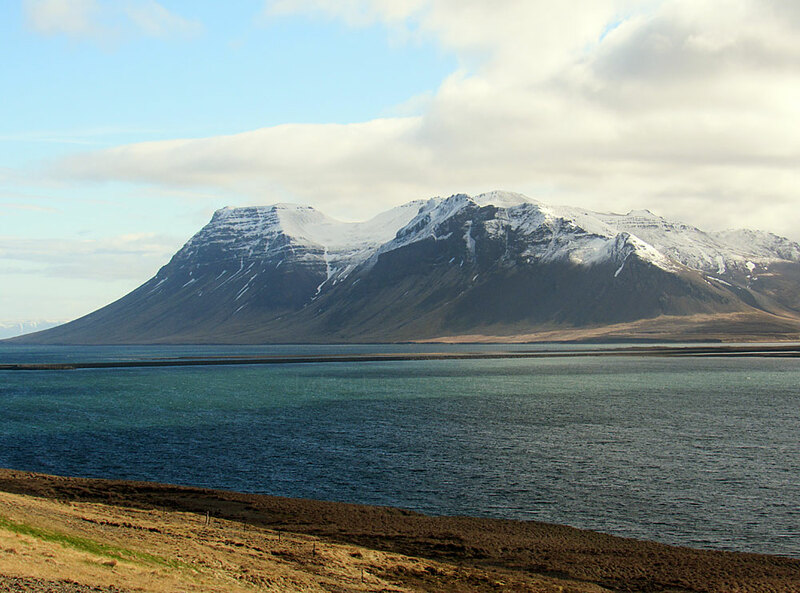 The Snaefellsnes Peninsula (when you can see it!) 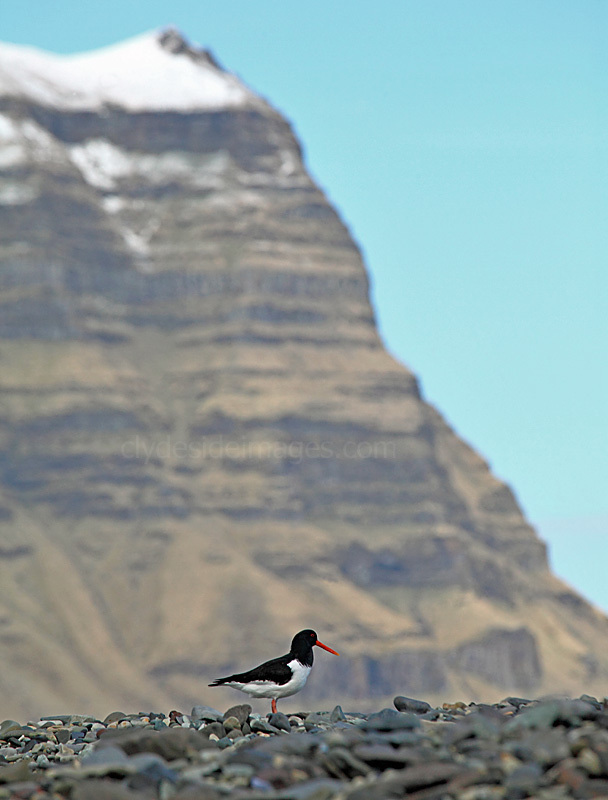 is often called 'Iceland in Miniature' as it gives a taste of what the rest of the country has to offer. 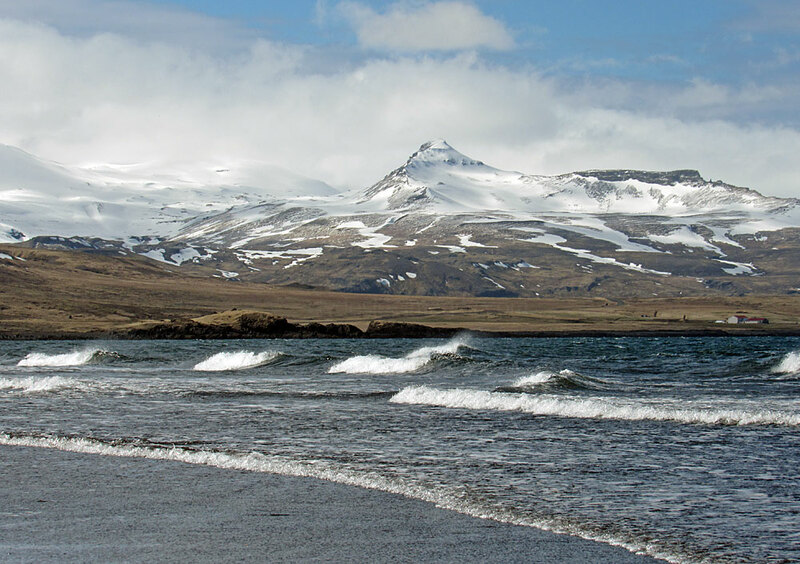 Majestic fjords, beaches, high coastal cliffs with abundant bird life, small fishing villages, lava fields, and the Snæfellsjökull glacier, which is a 1446 metre-high dormant volcano are just some of this region's attractions. 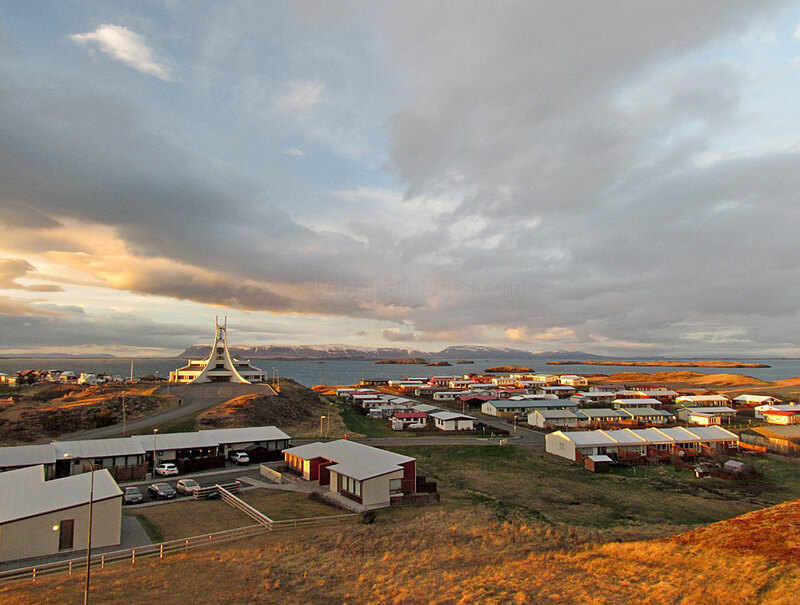 Base for two nights while touring the Snaefellsnes region was Stykkisholmur which is situated on the edge of Breiðafjörður Bay, on the peninsula's north coast. 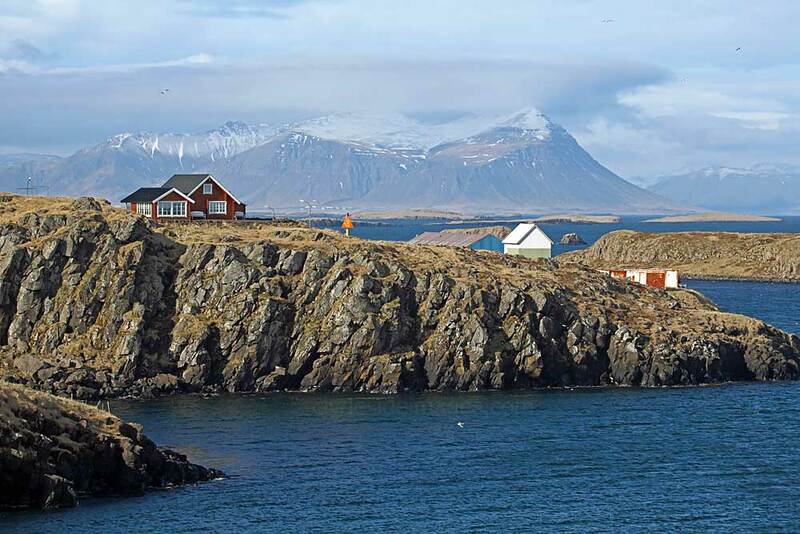 Our allocated room in the Hotel Stykkisholmur had a superb panoramic view and the clouds obligingly lifted soon after we checked-in to reveal a skyline of snow-capped hills to the east, on the far side of the islet-strewn fjord. 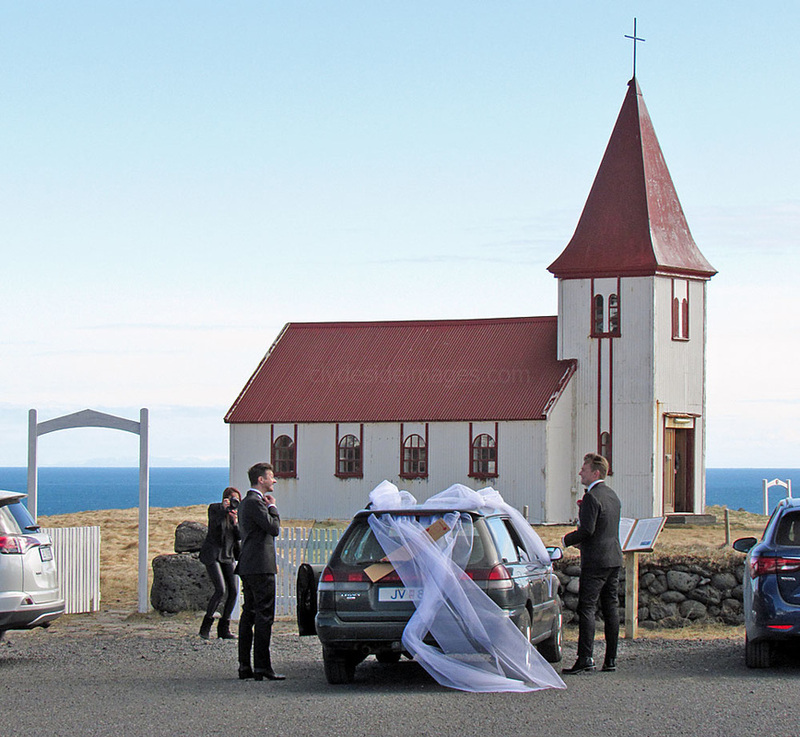 We`d chosen the next day for a drive around the Snaefellsnes Peninsula and despite a poor forecast ​it was mainly sunny, albeit with the usual gale force winds - Iceland is definitely the place to open a chain of kite shops! We opted to head west initially, along the north coast to cover the peninsula in an anti-clockwise direction. 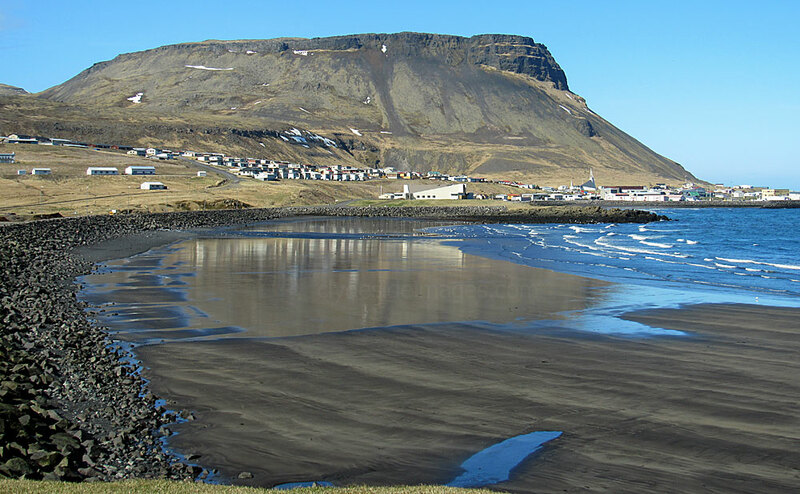 Here, fishing communities including Grundarfjordur, Olafsvik and Hellisandur, occupy bay shores which are protected from much of the region's stormy weather by the mountains running along the peninsula's spine. Overall, I found that the standard of roads travelled was excellent. 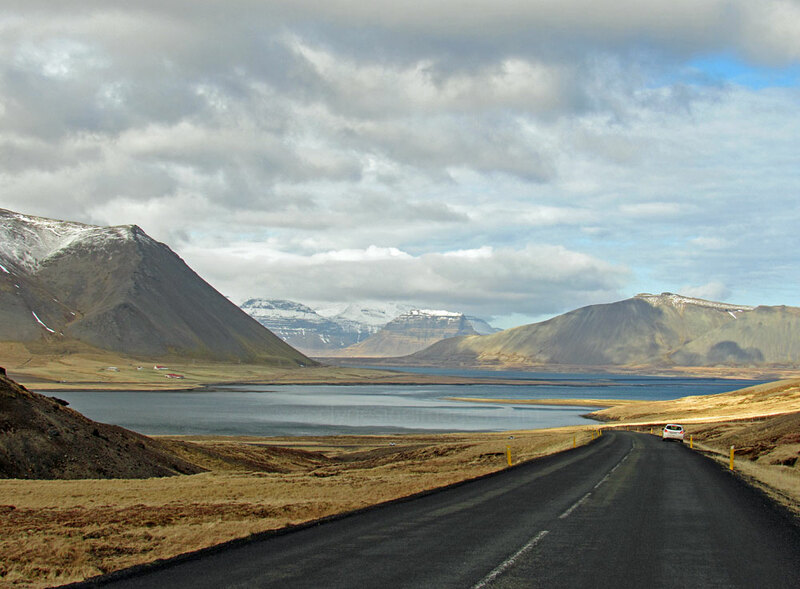 The surface was well maintained with very few potholes, however, once you leave Reykjavik behind there is no hard shoulder or verge, and places where you can safely pull over for a quick photo, particularly on the peninsula, are scarce apart from the allocated tourist spots. 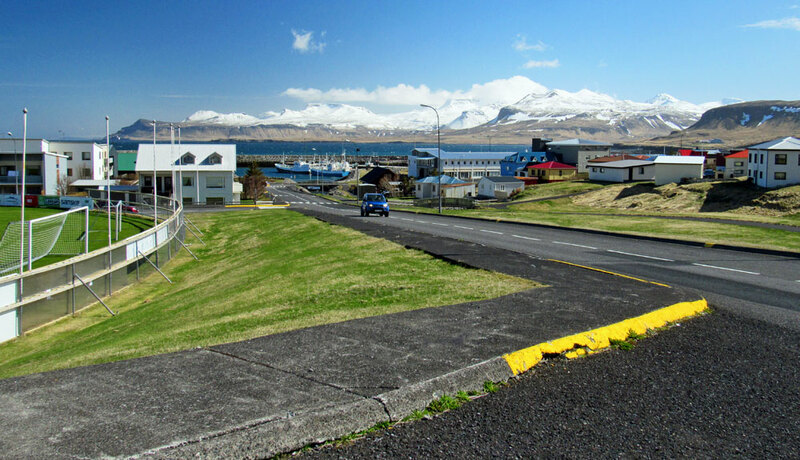 There are numerous, sometimes very steep, unprotected drop-offs, literally just inches away and the outside edges of the roads in Iceland are marked solely by well-spaced 2-foot high yellow posts (4-foot over high passes and stretches where heavy snow is common) - personally, I'd prefer a length of crash barrier at the most precarious spots! We passed an abandoned camper van lying on its side in a ditch which emphasised the point. Just one of the region`s numerous moss-covered lava fields. 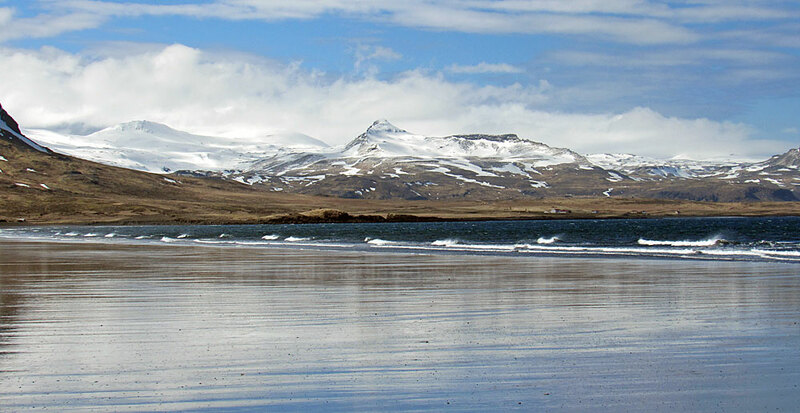 Looking north from the coast road near Grundarfjordur towards the snow-capped peaks of the West Fjords. 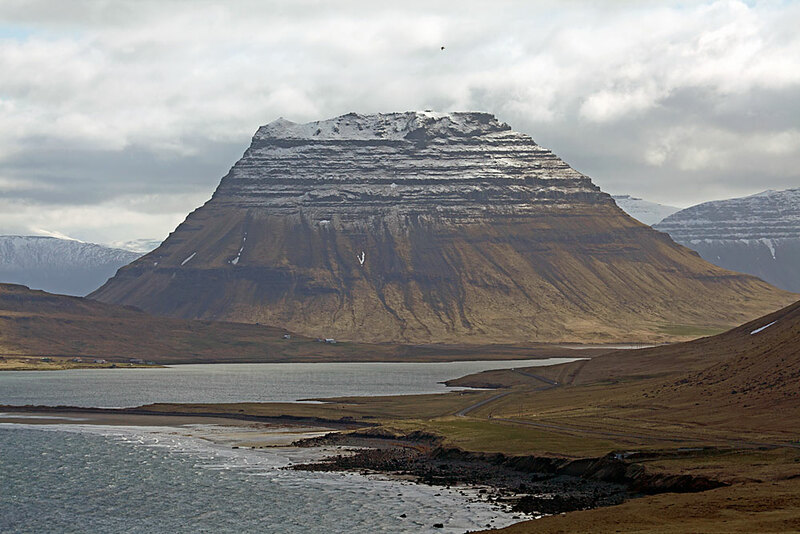 Grundarfjörður is located roughly halfway along the peninsula, 45km from Stykkisholmur, and lies at the foot of rugged Mt Kirkjufell (463m). 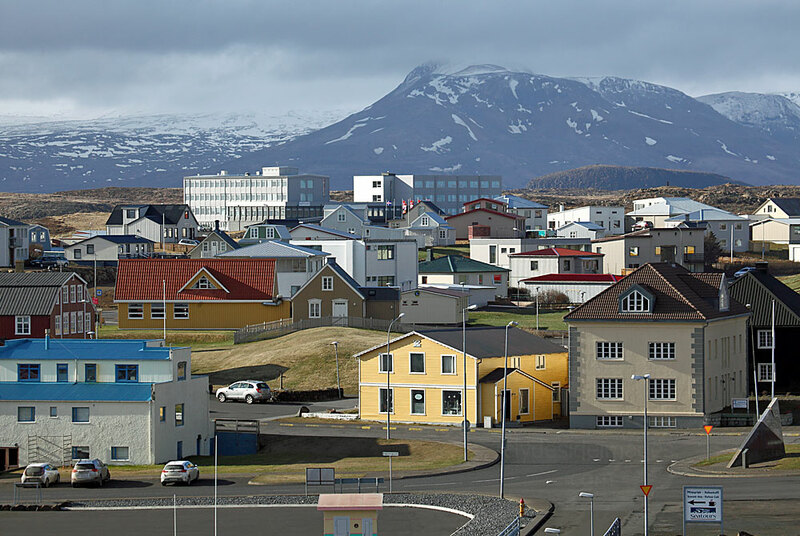 This settlement was established in 1786 by the Danish King as one of six commercial centres in Iceland. 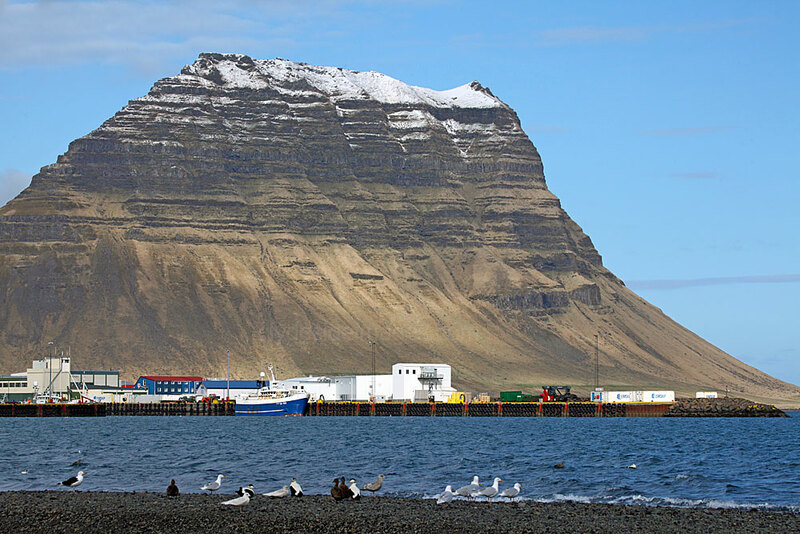 From 1800-1860, French fishermen also profited from the excellent harbour here and used Grundarfjörður as their base, dismantling all trace of their presence when they eventually returned to their homeland. 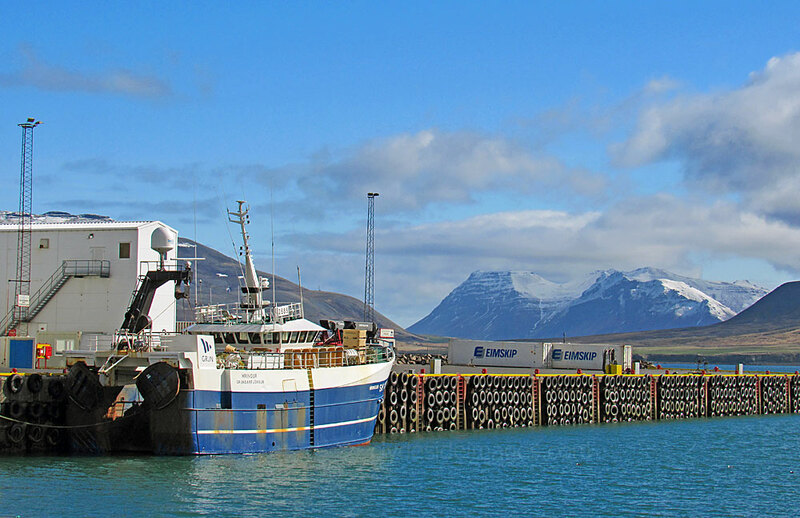 Fresh fish stern trawler Hringur (SH-153) is one of several vessels based at Grundarfjörður. She was was originally named Marina Polaris. 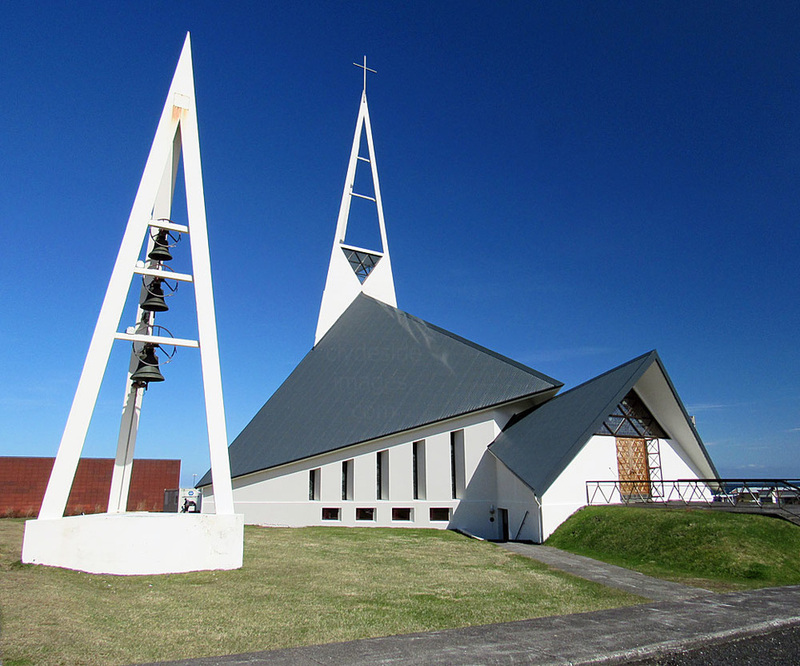 Grundarfjörður Church was opened on 31 July 1961 having taken five years to build, although the interior took far longer to complete. 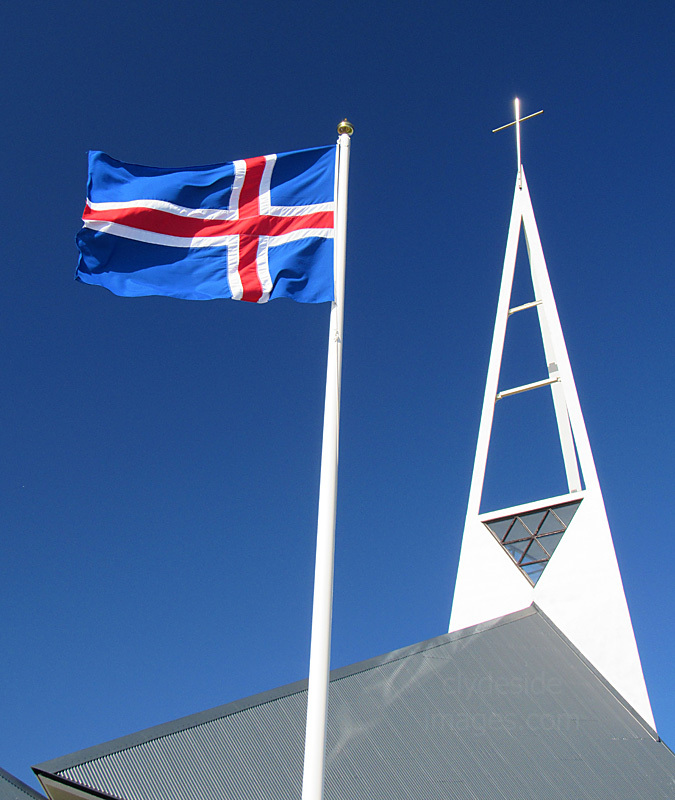 The architect was Halldór Halldórsson, who also designed various Icelandic churches including the one at Dalvik in the north-eastern part of the country. The pulpit was made to resemble the bow of a ship, while the wall lights are designed to resemble those of a lighthouse or rows of ship lights out on the sea. 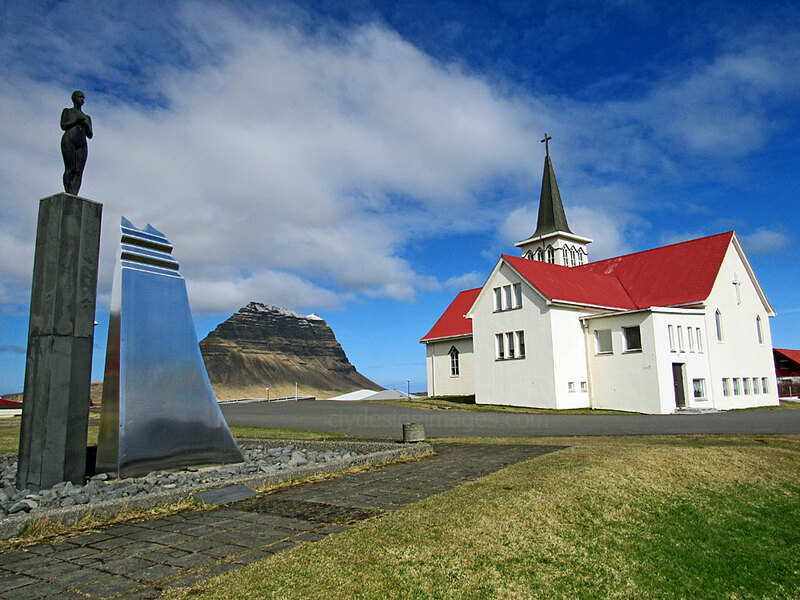 Guðbrand’s Bible is the oldest bible in Icelandic printed in Iceland by Icelanders and thus played a big role in preserving the Icelandic language. Prior to its publication, most religious reading material was in Danish. One of reasons the Norwegians lost their original language was because of the lack of the printed word in that language in 16th century. 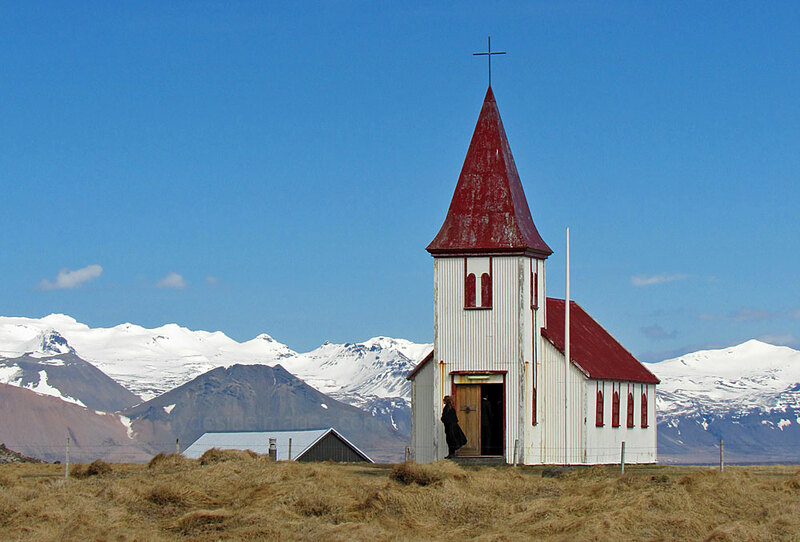 The bible is named after Bishop Guðbrandur Þorláksson, who printed the work in 1584 using his own printing press. The original batch of 500 copies took seven men 2 years to produce and it is said that at the time one of these bibles was worth 2-3 cows each. Surprisingly a fair number of the first batch survive and a first edition original was auctioned at Sothebys in 1980 and sold to an Icelander for £7,500 sterling. The Guðbrand’s Bible is one of the very few old books that have been reprinted in the original version. It was litho-printed in 1956-57 where 500 copies were made, and again in 1984 with 400 copies being printed. 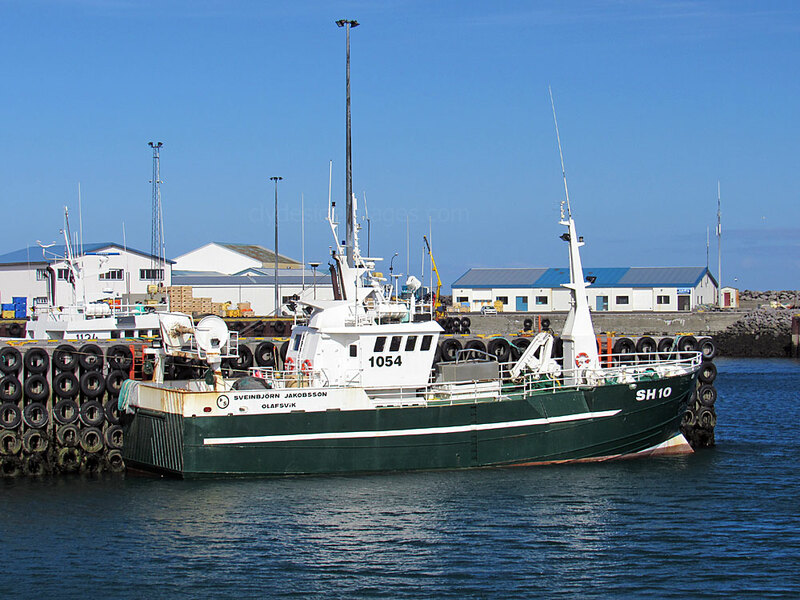 The church has one of the 1984 reprints on display which was donated by the owners and crew of the fishing boat Runolfur (SH-135) in 1984. 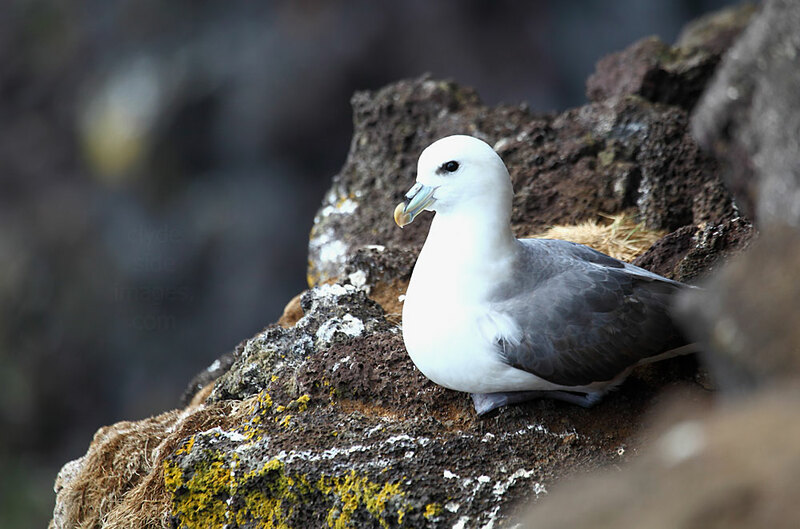 One of the best places to see Iceland's White-tailed Eagles is the remote West Fjords, but Grundarfjörður has become a sanctuary for what is the country's largest predatory bird. Needless to say, I didn`t spot any during the short time I was in the area. Overall, wildlife sightings, particularly of birds, didn't live up to expectations with Eider, Golden Plover, Black-tailed Godwits, Redshank and various species of geese being about it. Olafsvik Harbour from the east. 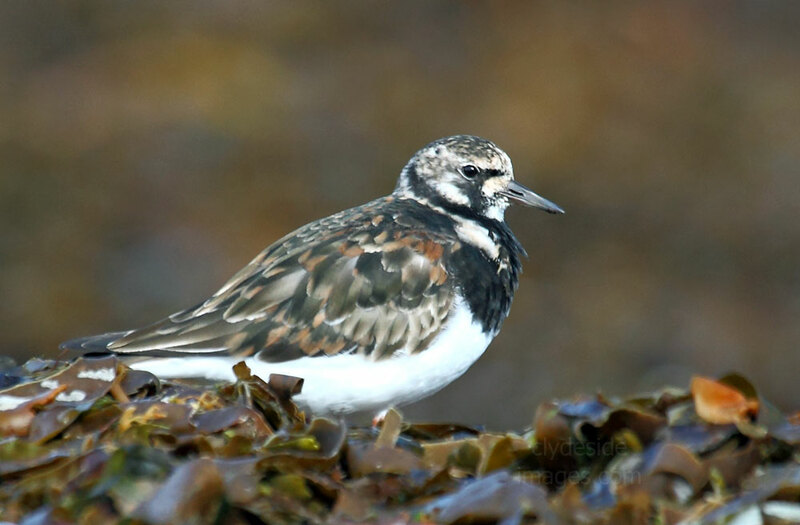 I snapped a mixed flock of geese and gulls in a field just outside of Olafsvik and managed a shot of one of the Turnstones and Oystercatchers on the shingle beach on the opposite side of the road. The Ringed Plovers darting around were just too quick for me on this occasion though. 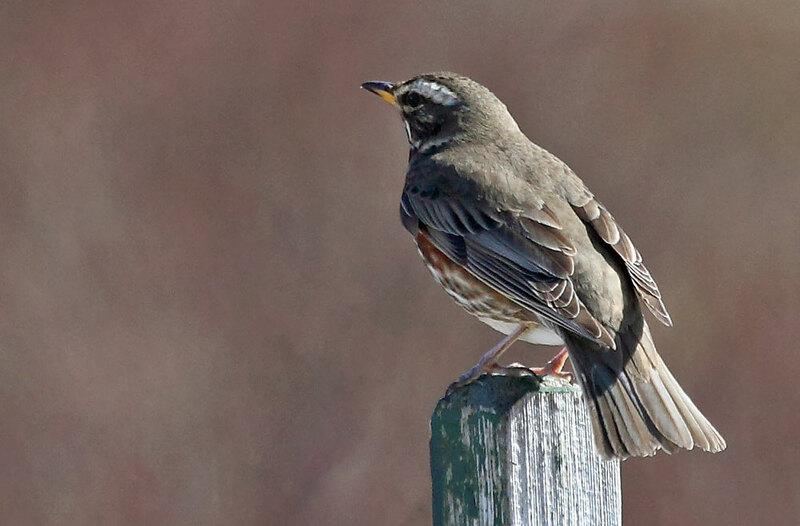 A Redwing is pictured below. 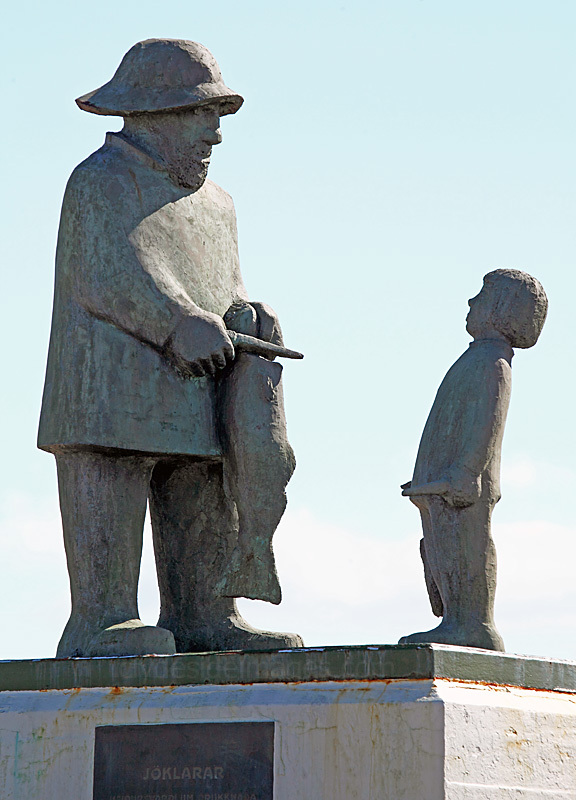 Olafsvik, although fairly small, is the peninsula's most productive fishing community. 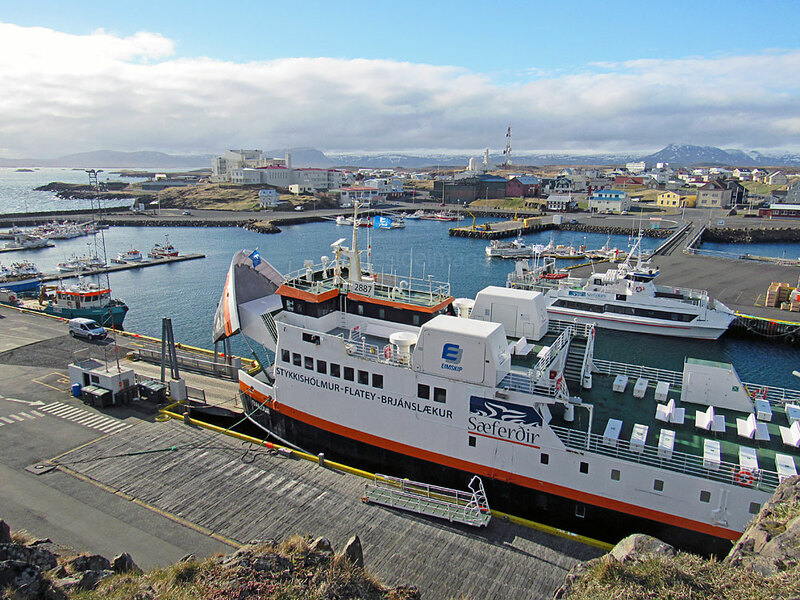 It's also Iceland's oldest established trading town, having been granted its charter in 1687. 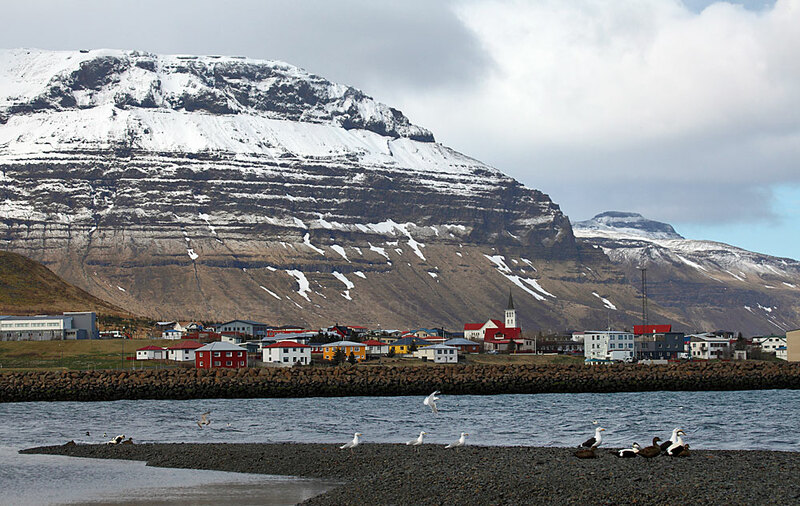 It's harbour, like the one at Grundarfjörður, has a line of snow-capped peaks as a stunning backdrop. A large timber warehouse, built in 1844 by the town`s main fish trader, now houses a folk museum which contains various exhibits connected with the industry and old black & white photos of the area. 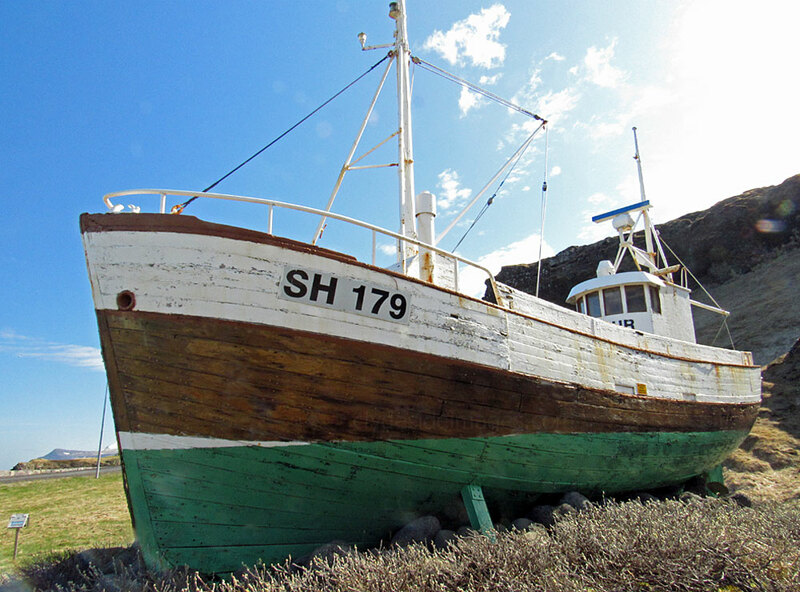 This fishing boat dates from 1962 and was built by the K.E.A. 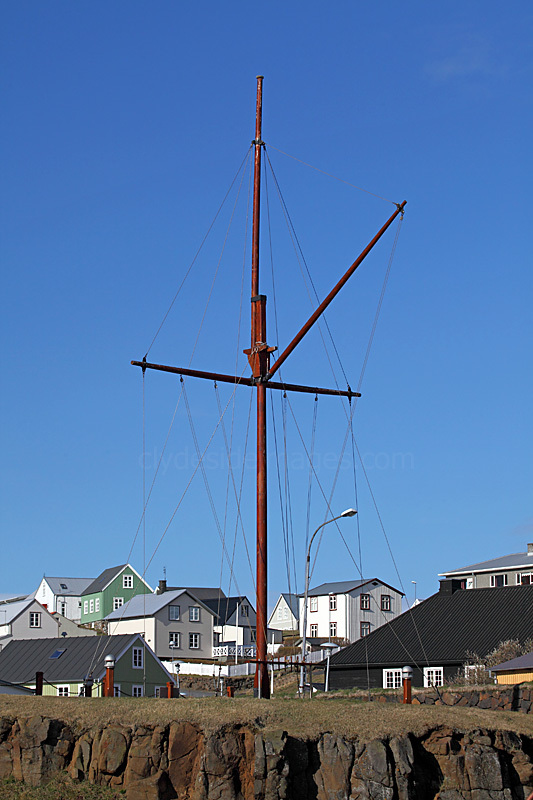 Shipyard at Akureyri, Iceland, and is made mainly of oak. 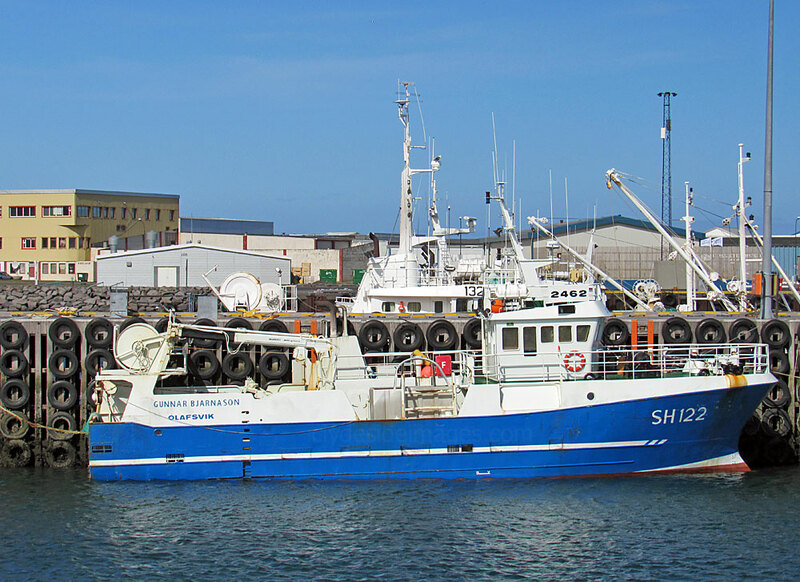 She has had several owners and name changes during her career before her she was given her current identity Tindur ​(SH-179) in 1987. 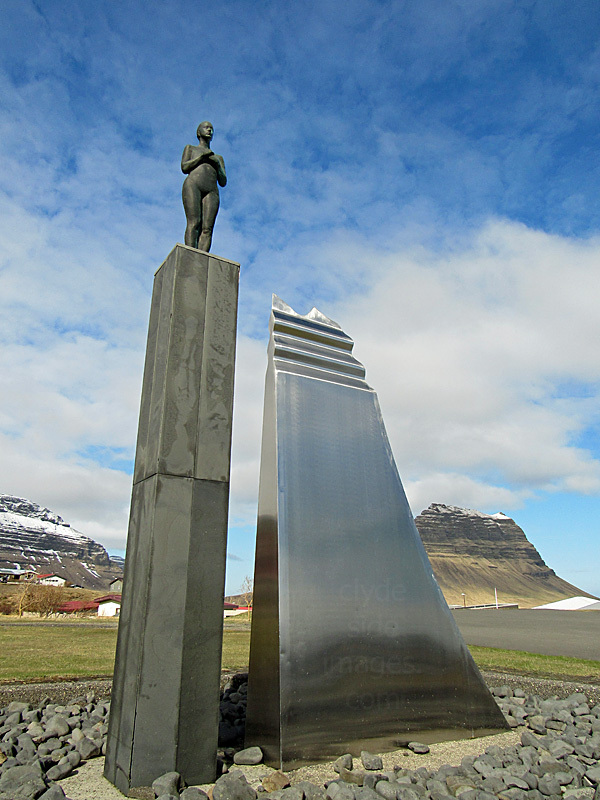 She was placed just outside the eastern entrance to the town as a memorial on 15 February 1997. 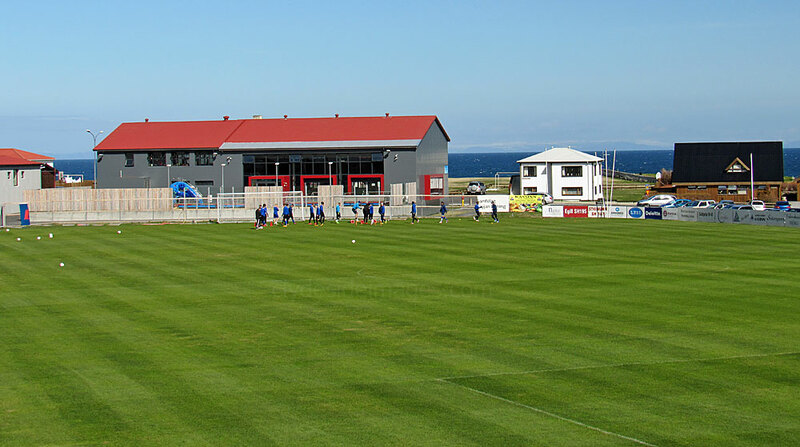 ​The town`s football team, Ungmennafélagið Víkingur, also known as Víkingur Ólafsvík, played in the Úrvalsdeild, the Icelandic top tier, for the first time in 2013. The team got relegated the following season but are back in the top division this year after finishing champions of the lower league in 2015. 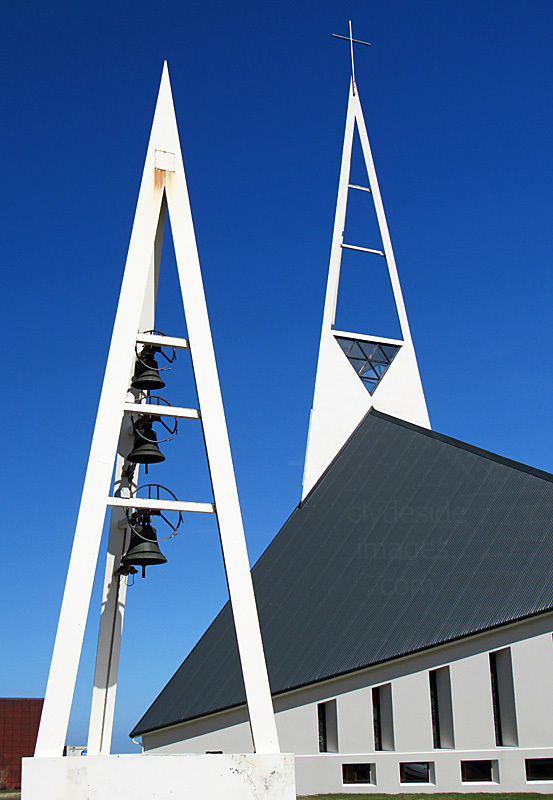 Olafsvik`s modernistic church is made up almost entirely of triangular pieces. 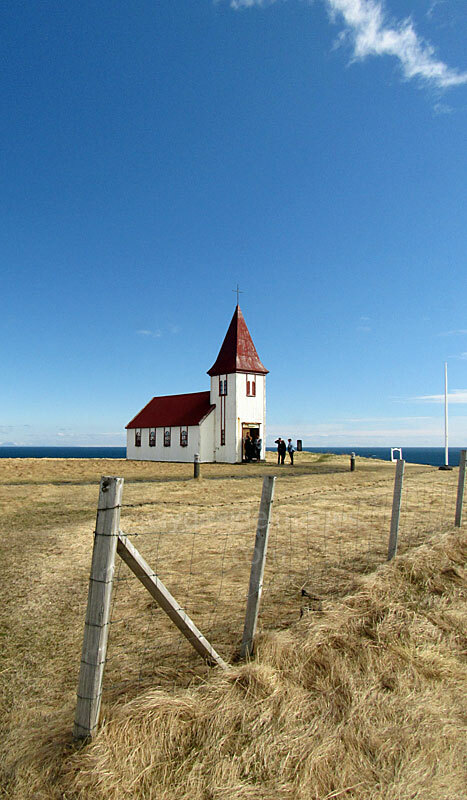 This is another of the peninsula`s churches, most of which are set in a stunning location. 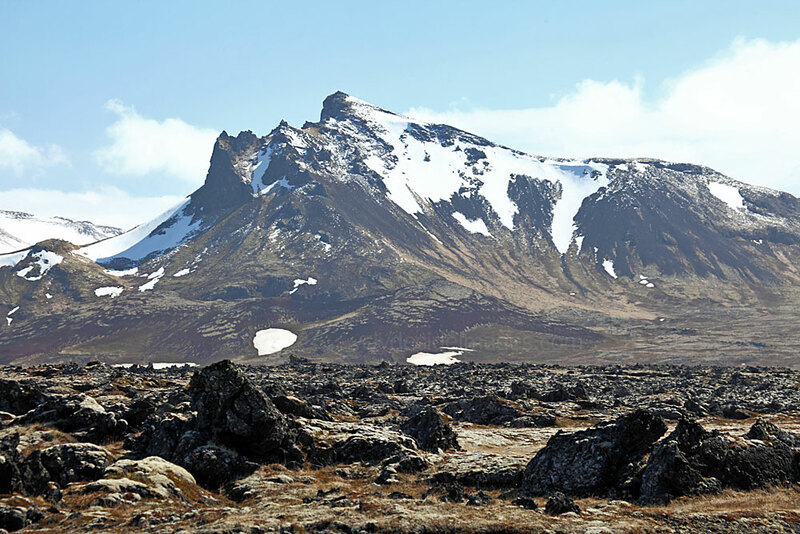 One of the best known lava fields in Snæfellsnes is called Berserkjahraun or Berserk lava on the north-side of the Snæfellsnes peninsula. 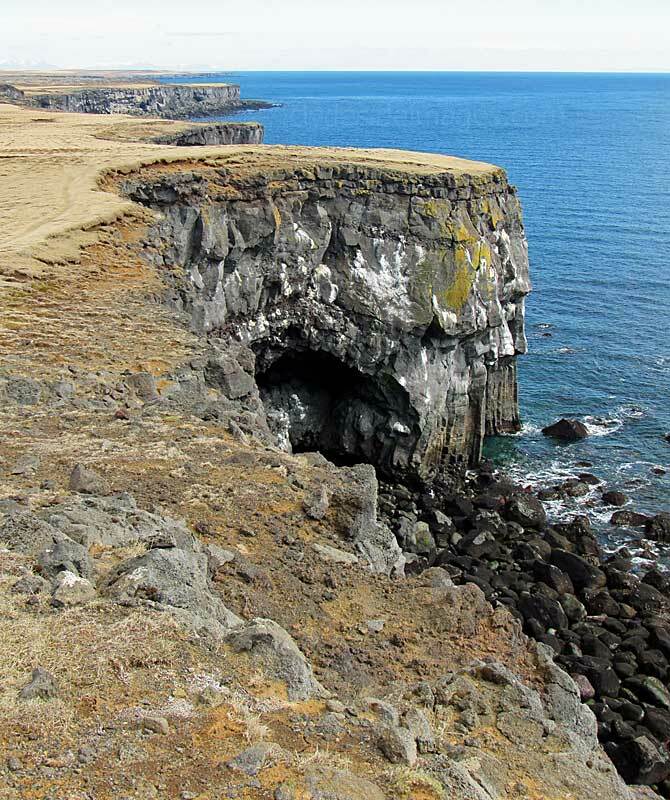 Berserkjahraun lava is 4000-3600 years old. 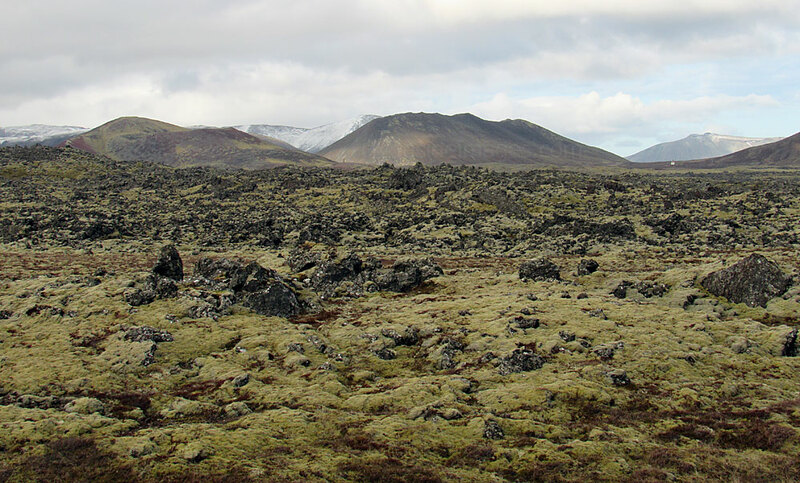 The lava, now covered in a rich, velvety moss, stems from four differently sized scoria craters, and has formed two lakes, one of which can be seen if you visit the waterfall in Vatnaleið. 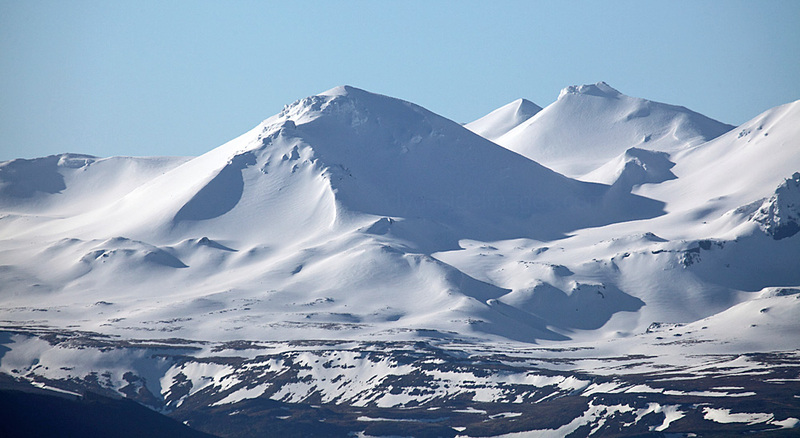 Snæfellsjökull glacier is a dormant strato-volcano, 1446 metres high with a crater 200 metres deep. 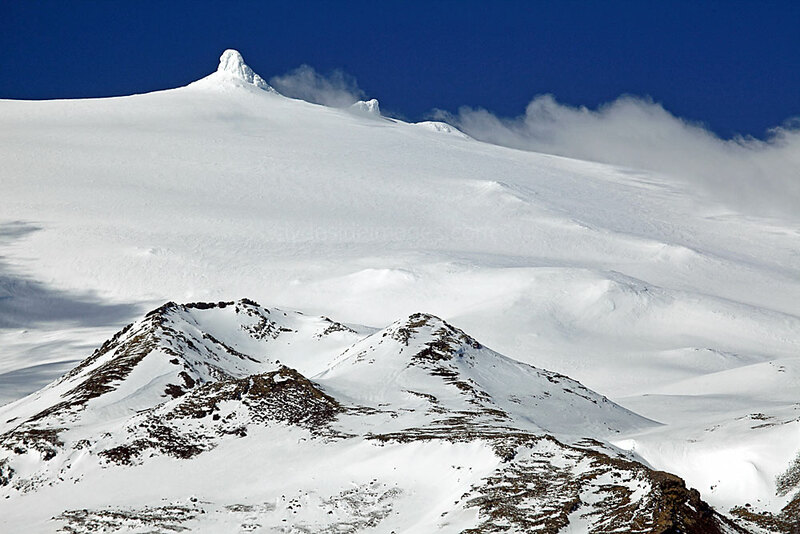 It dominates the western end of the 90 km long peninsula. 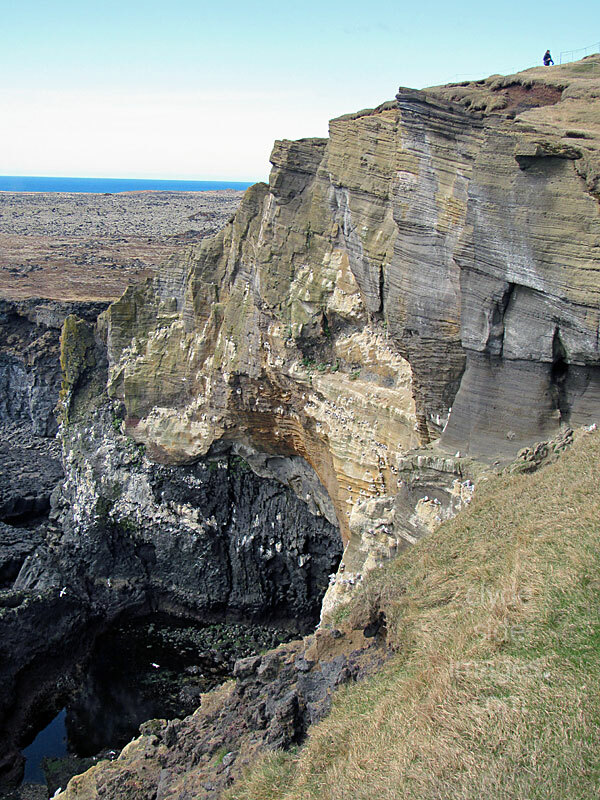 French fiction writer Jules Verne chose this location as the access point for his party of heroes to begin their subterranean adventure in the 19th century novel 'Journey to the Centre of the Earth'. 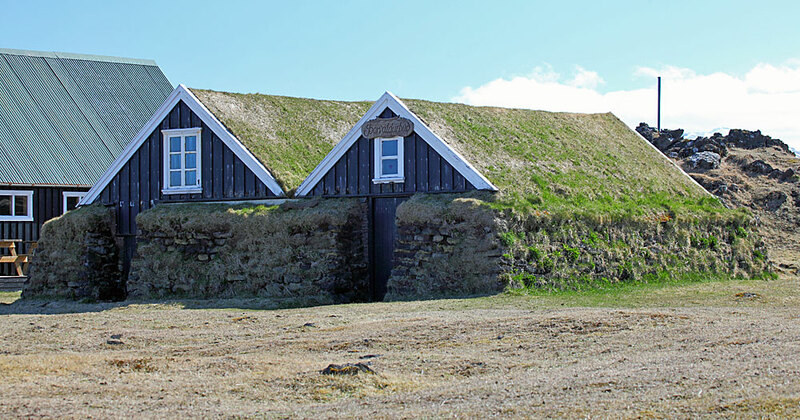 The fishermen`s turf cottages beside the main road just outside Hellissandur contain the local Maritime Museum which I didn`t visit. 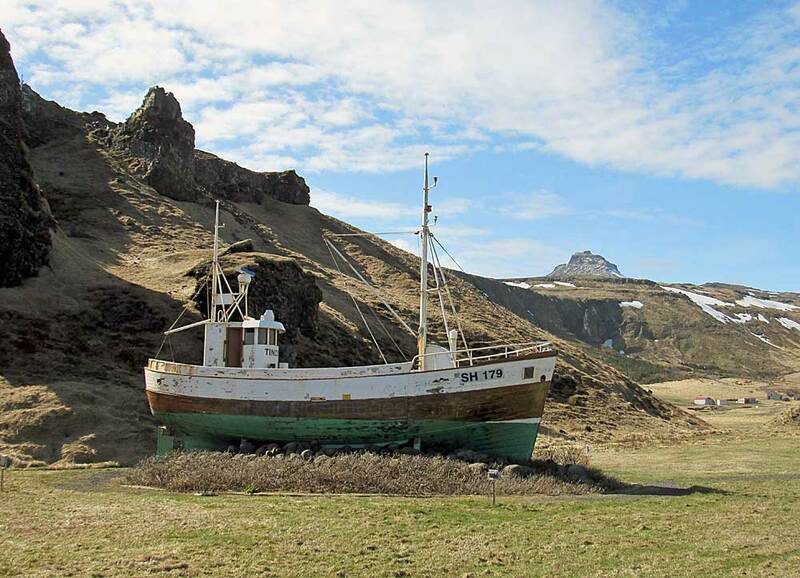 The larger of the two buildings holds an assortment of fishing equipment and the oldest rowing boat in Iceland which dates from 1826. 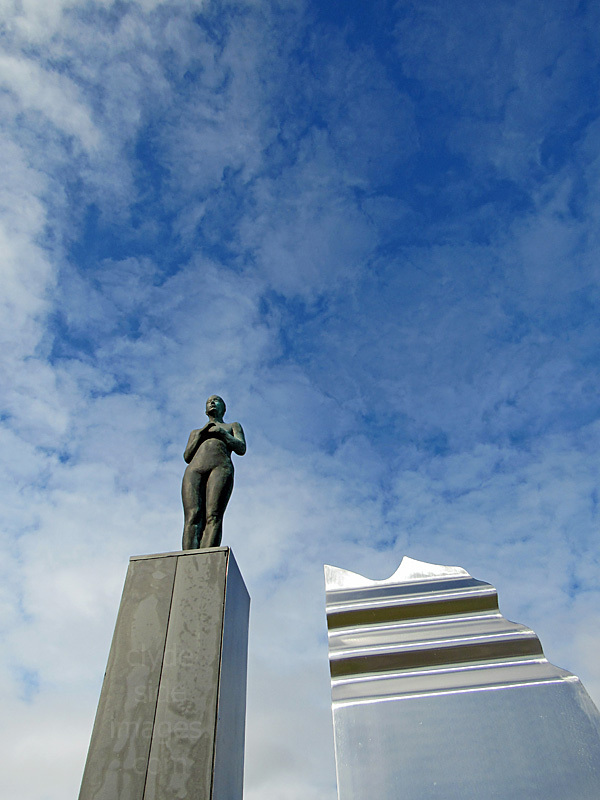 The adjacent statue called `Jöklarar` by the artist Ragnar Kjartansson, commemorates the fishermen who lost their lives at sea. 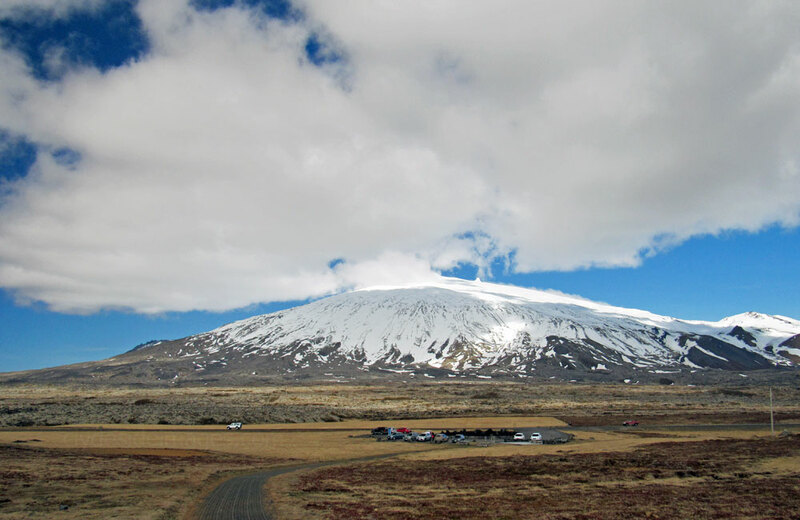 In addition to Snæfellsjökull, there are several smaller volcanoes dotted around the lowlands of the park, namely Skarosvik, Djupaldonssadur, and Holaholar. 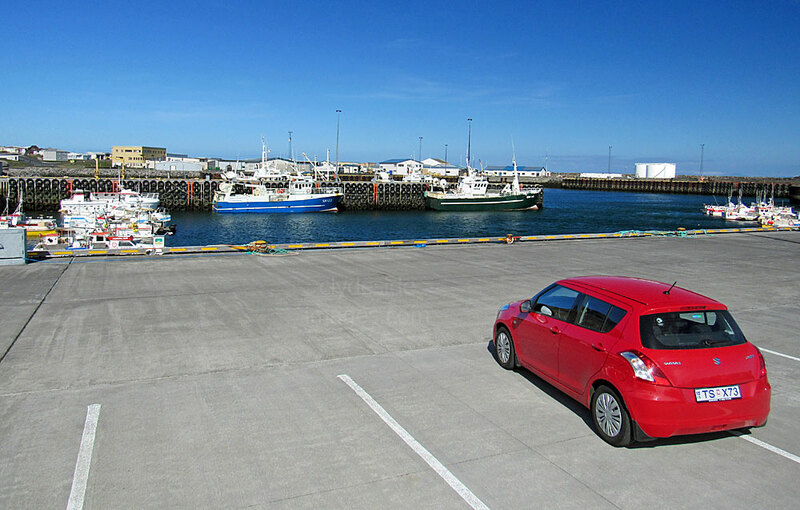 Although car-borne visitors can comfortably drive round the peninsula in a single day, there is much to interest the outdoor enthusiast with walking trails criss-crossing the ancient lava fields, cycle routes and for the more adventurous, guided glacier tours with one of the many activity companies. 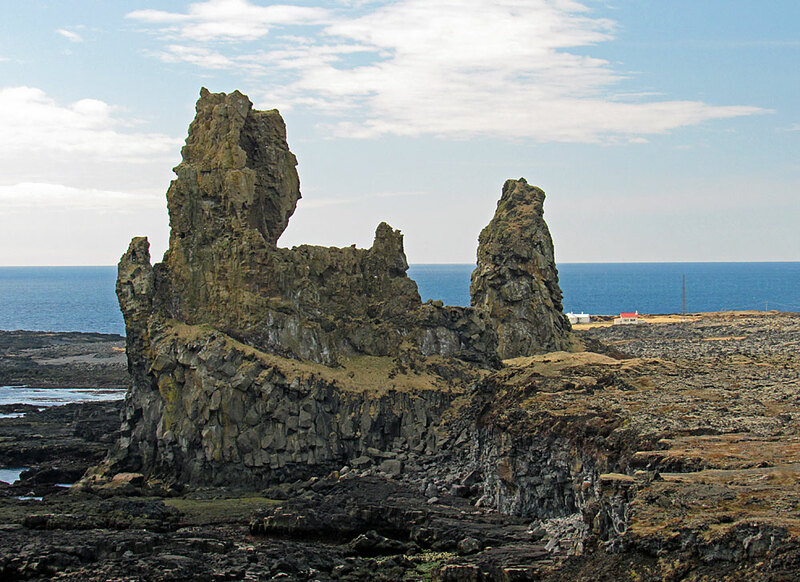 The Londrangar rock pillars are easily reached from the main road. 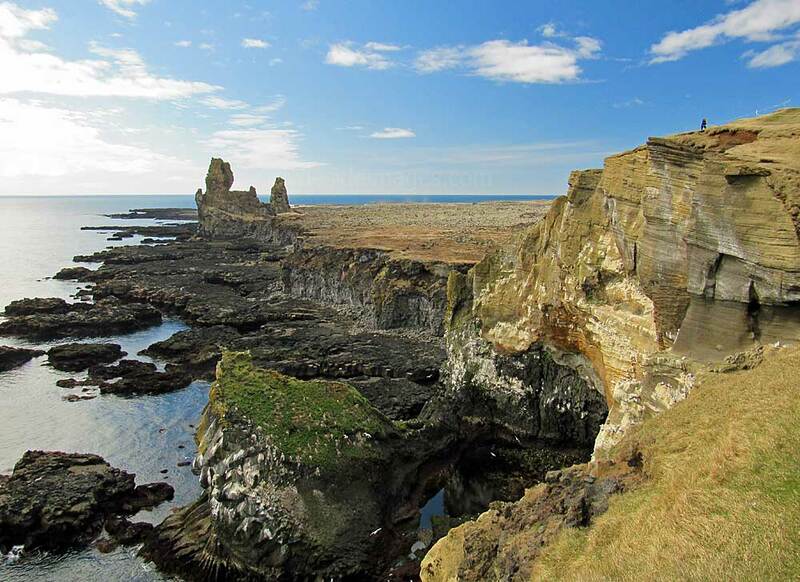 The taller of the two is 75m high and known locally as the `Christian pillar` with its smaller neighbour called the `heathen pillar` although the origin of these names is not clear. Both are remnants of a basalt cinder cone. 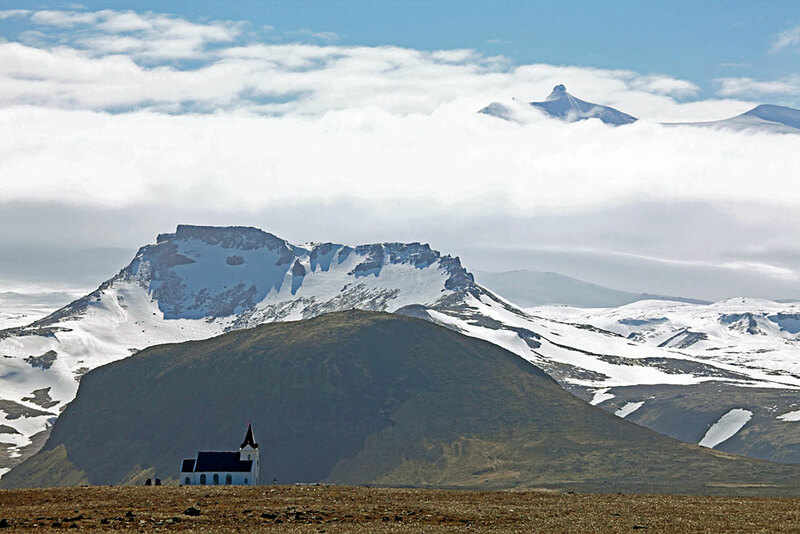 ​For centuries, Hellnar (below) was among the largest fishing villages in the shadow of the Snaefellsjokull ice cap and now a hotel, café and the Snæfellsjökull National Park visitor´s Centre is located here. 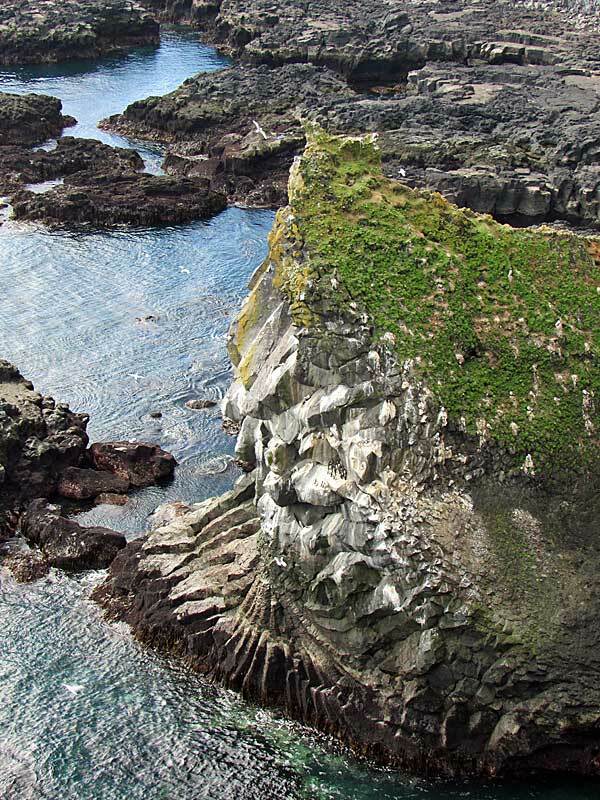 One of the most popular short walks in the area is along the elevated coastline between Hellnar and the village of Arnarstapi to the east. 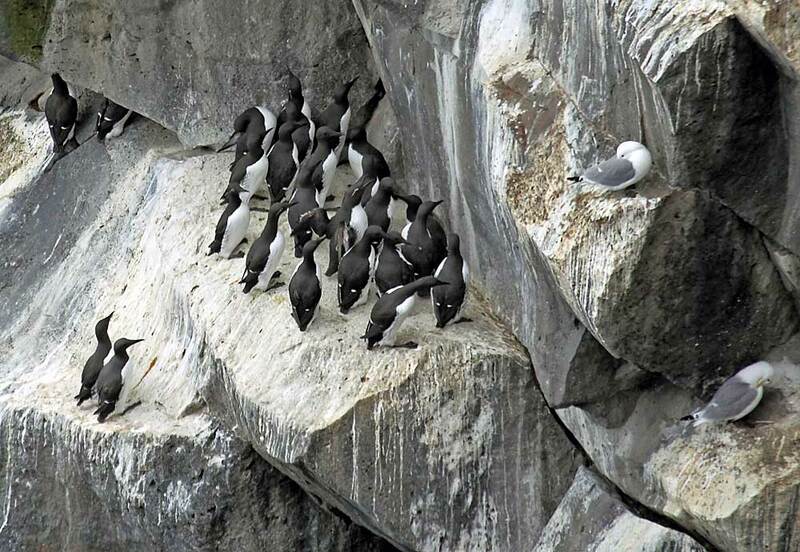 The cliffs used to be famed for the vast number of seabirds including Puffins which nested on the clefts and crevices but nowadays, like many places across Europe, the numbers have plummeted and although there are still some Guillemots and Kittiwakes setting up home here, the only puffins visitors are likely to see are out on the water. 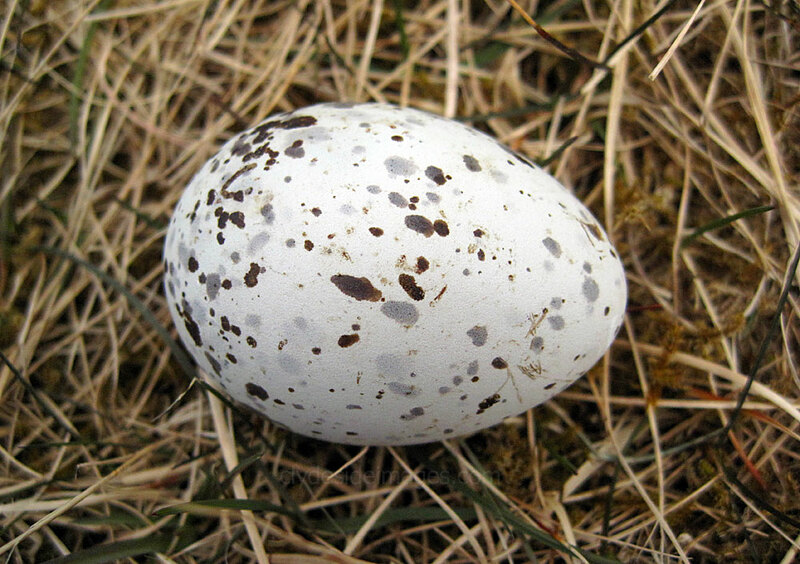 Wheatear are common on the wind-clipped turf on the cliff tops. 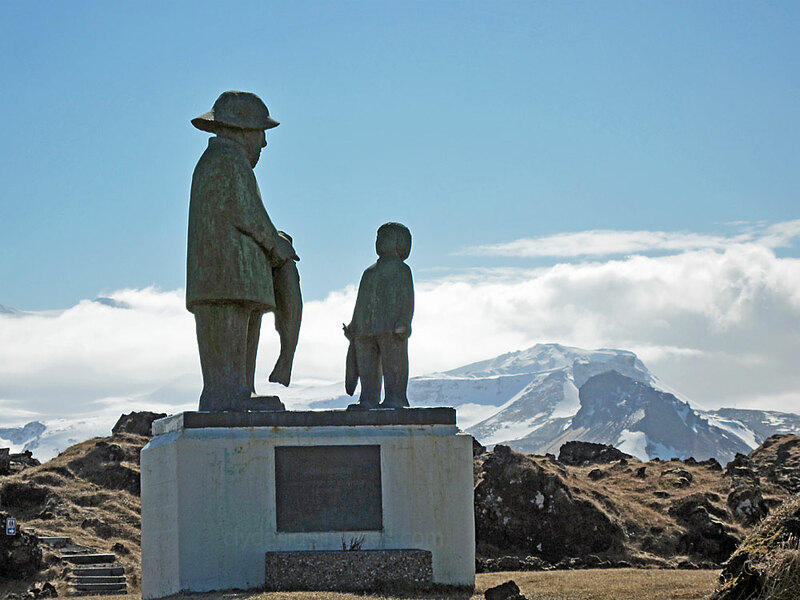 The village of Arnarstapi is a starting point for hikes and Jeep-drives up to Snaefellsjokull but it is also known for its snow-mobiling excursions across the glacier. 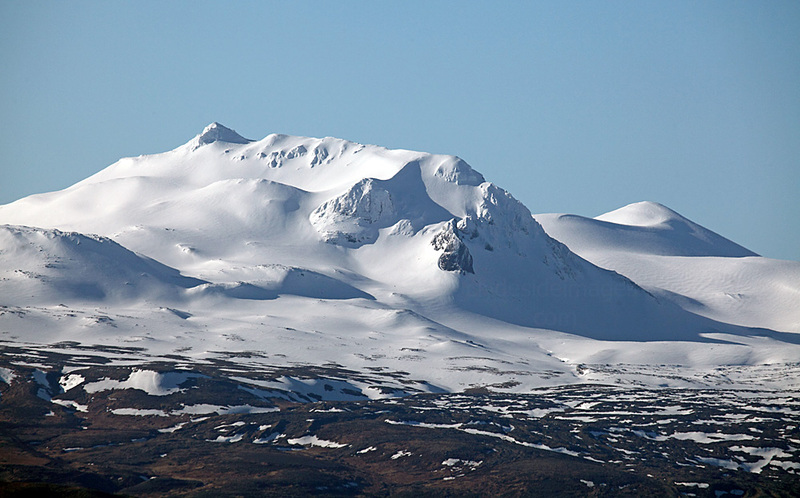 Larger and slower open-topped Snowcats are also available for non-adrenalin junkies. 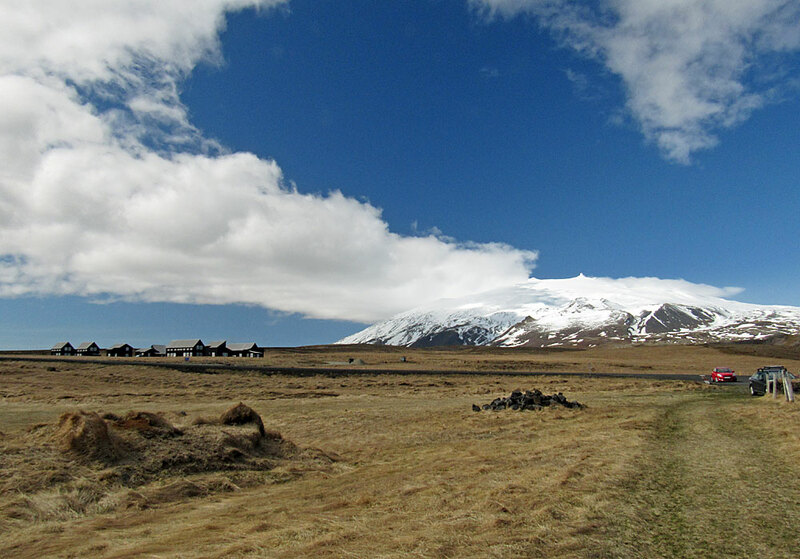 Continuing eastward along the main road from Hellnar, the scenery is still spectacular but farmland becomes more prevalent, much of it providing grazing for the numerous Icelandic horses. Like those on the north side of the mountains, some of the south coast villages are set against dramatic mountain backgrounds but by this time it had been a long enough day so it was back to the hotel for dinner and a few well-earned drinks! 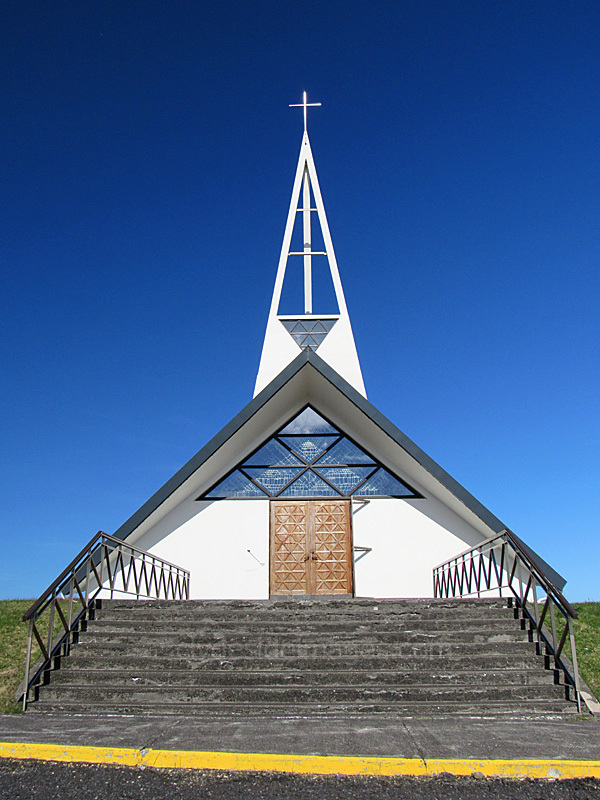 The picturesque wooden church was built in 1945 on the site where the original church dating from 1833 once stood.